NEW for 2019! 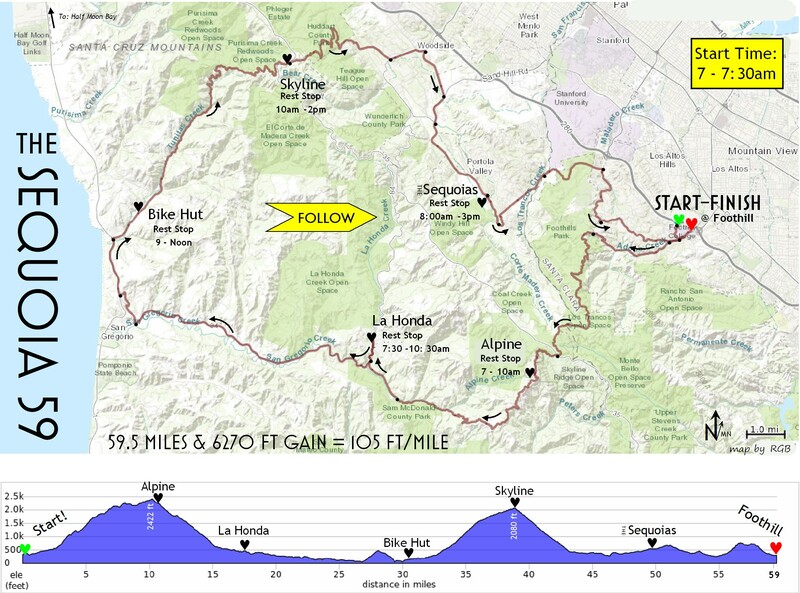 [Register Here] This 59.5 mile route has a tough but very attainable 6270 ft of gain, so if 72 miles @ 106.8 ft/mile seems a bit daunting, this new route is for you! Departing from Foothill right after those 72's, you'll also climb via Page Mill to Skyline and descend W. Alpine to your second Rest Stop in La Honda. After that delightful break, descend gently westward towards the cool coast and climb the 1.2 mile northern end of Stage Rd up to Hwy One. Your third well stocked Rest Stop is just a mile east of Hwy One at the delightful Bike Hut! The gorgeous Tunitas Creek canyon is your big test through the beautiful shaded redwood and oak forest for 8.5 miles up to the Skyline Rest Stop. After that break, descend down to Woodside, roll through Portola Valley and the last Rest Stop 9.3 miles from the finish line! Descend Altamont before you roll into the colorful finish zone and the congratulatory ice-cold chocolate milk! We reserve the right to cancel The Sequoia event for any reason, however improbable. This is a Rain or Shine event. There are no refunds. Net proceeds support communities and non-profit organizations. Over $10,000 donated since 2017.